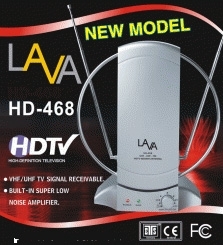 The Lava HD 468 Indoor TV Antenna has an incredible 36dB Gain, making it the most powerful indoor uhf/vhf/fm antenna we offer. The Lava HD-468 has a rated 50 mile range, tested 82.3 mile range. Although, we recommend up to a 15 mile range to achieve a strong solid signal from most available channels. 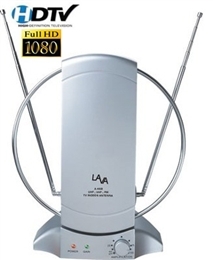 The HD-468 Indoor Antennas simply plug the power supply into a regular wall socket and then screw coaxial into the back of your HDTV. 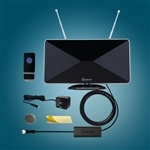 If you have a standard television you apply the coaxial into your digital to analog converter box then plug your digital to analog converter box into your television. Unfortunately this product was worse than the previous one from the store. This one only received 3 channels while the other one at least gave me 7 channels. Very disappointed with with product I think I need to return it and get something else. We are very pleased with the product. I'm happy with the antenna. I can receive the channel that Directv dropped.